Just thought I'd do a check-in after a long snowy winter! Man, am I glad we're officially into spring! Well, it must be spring because my husband has hung up his skis after competing well in about five major ski races and the bike has been out a few times. We've had our first thunderstorm. All kinds of tulips and daffs are up, and our forsythia is out. I've been out on my upper deck already and we've had several barbecues and we have already been sleeping in the summer bedroom! 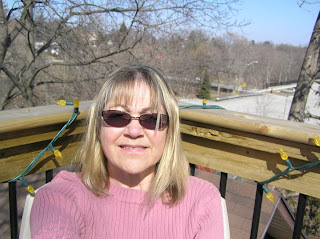 I am so enjoying the spring and looking forward to the summer. Have a happy, hopeful spring!